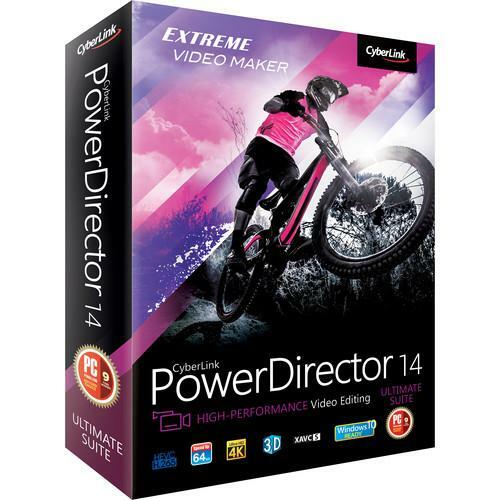 We recommend checking out our discussion threads on the CyberLink PowerDirector 14 Ultimate Suite PUS-EE00-RPM0-00, which address similar problems with connecting and setting up Video Editing CyberLink. The user manual for the CyberLink PowerDirector 14 Ultimate Suite PUS-EE00-RPM0-00 provides necessary instructions for the proper use of the product Professional Video - Post Production - Video Editing. 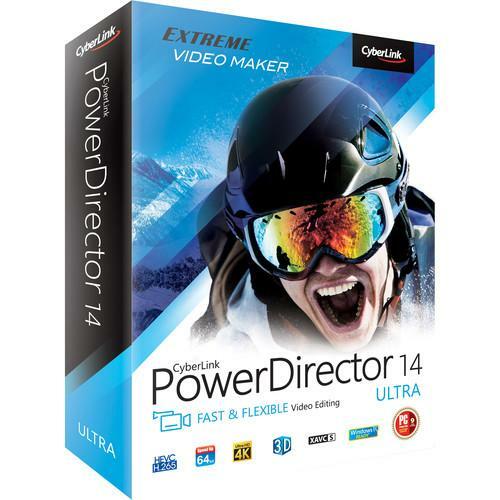 CyberLink PowerDirector 14 Ultimate Suite is a high-performance and comprehensive video editor for the home user. It features a native 64-bit, fast-rendering engine and supports a wide variety of formats including UltraHD 4K resolution (3840 x 2160), offering the power and flexibility to efficiently work with footage from most sources. The interface is designed to be very intuitive, allowing for simple and enjoyable operation. PowerDirector 14 Ultimate Suite is loaded with creative tools, effects, and transitions, such as Motion Tracking, Screen Recorder, and Picture-in-Picture Designer, and also includes cinematic 3rd-party effects packages. It supports up to 100 tracks on the timeline, so you can drop in numerous video, audio, and photo files and effects to make your project just what you want it to be. 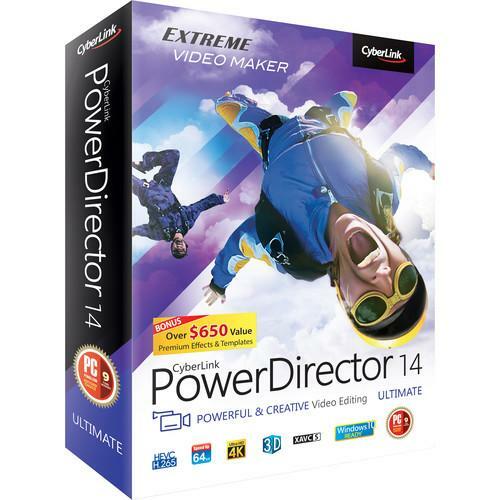 The different PowerDirector 14 versions -- Ultimate Suite, Ultimate, and Ultra -- all share the same video editing features. PowerDirector 14 Ultimate Suite includes ColorDirector 4, AudioDirector 6, twelve effects packages, mostly from 3rd parties, and 40GB of CyberLink's Cloud Service free of charge of one year. Note: For users of NVIDIA cards using pre-Kepler architecture who have updated to graphics driver 340.43 or later, the CUDA video hardware video encoder feature in PowerDirector is no longer available. To re-enable hardware acceleration, please download and install an earlier driver. Output Device Support The list below consists of devices from major brands that were tested by CyberLink. However, the list is not comprehensive. If your device is not on the list, it may still be compatible with PowerDirector. Miscellaneous Accelerated video encoding on AMD graphics cards requires the user to install the AMD Media Codec Package, also known as the Avivo Package. This package is available as an optional download when obtaining an AMD Catalyst Display Driver for AMD desktop graphics and notebook graphics products. Box Dimensions (LxWxH) 7.6 x 5.4 x 1.7"
The user manual for the CyberLink PowerDirector 14 Ultimate Suite PUS-EE00-RPM0-00 can be downloaded in .pdf format if it did not come with your new video editing, although the seller is required to supply one. It is also quite common that customers throw out the user manual with the box, or put the CD away somewhere and then can’t find it. That’s why we and other CyberLink users keep a unique electronic library for CyberLink video editings, where you can use our link to download the user manual for the CyberLink PowerDirector 14 Ultimate Suite PUS-EE00-RPM0-00. The user manual lists all of the functions of the CyberLink PowerDirector 14 Ultimate Suite PUS-EE00-RPM0-00, all the basic and advanced features and tells you how to use the video editing. The manual also provides troubleshooting for common problems. Even greater detail is provided by the service manual, which is not typically shipped with the product, but which can often be downloaded from CyberLink service. If you want to help expand our database, you can upload a link to this website to download a user manual or service manual, ideally in .pdf format. These pages are created by you – users of the CyberLink PowerDirector 14 Ultimate Suite PUS-EE00-RPM0-00. User manuals are also available on the CyberLink website under Professional Video - Post Production - Video Editing.